I was asked by a friend whether or not he should blog. I said, ‘yes’. He asked, ‘why?’. So, I wrote this blogpost to answer his question, because that’s how we roll. Strangely enough I had to think about this. It’s not like I don’t know, but to sum it up in a coherent list just makes you go.., hmmmm. 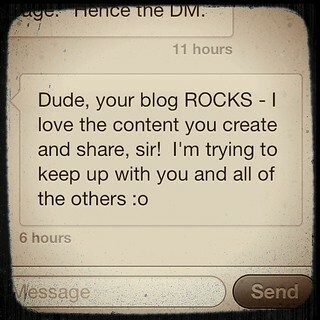 Thusly, here are a few reasons why you should blog. Your knowledge is a precious commodity, but people need to know what you know for them to accept you as an expert. Writing articles for your blog can provide just that. It’s the best place to direct people, because it will always be there. Just make sure you have your own hosting. Tumblr, Blogger or WordPress.com do not provide this (WordPress.org does). Ideally you create a community around your blog. Visitors who comment or share your content are part of your community. By following up on them your network can grow. You can direct new contacts straight to your blog, instead of a Twitter account or Facebook Page. Personal branding remains a powerful tool in your arsenal. By setting up a blog (or your own homepage) you can establish your own style which you can use throughout various social media, emails, presentations or anything else with your name on it. Creating a strong and recognisable brand is well worth the effort. This is more about what to write, but in the interest of adding value to your blog, helping people should be your goal. Providing articles which are genuinely helpful, without asking anything in return, will establish you as a trustworthy source of information. People respond well to that. Especially when you enjoy writing and spend enough time on your blog to get a good flow going. The rewards go beyond providing great content. The satisfaction of producing a good (looking) post can be significant. Also, remember that each post demands at least one image. Using images created by you tackles any copyright issues you may encounter. In the ever lasting quest for new (and better) content you have to keep developing. Always finding new subjects to write forces you to think creatively and learn new things. Educating yourself is a great point that I never really considered. Its true though, whatever I choose to write about, I always do some research about my subject first. Great point! wrote this knows his business, but I guess the learning never stops. Hey Ann.., yes, I always need to push myself to come up with something useful. The friend for whom I wrote this knows his business, but I guess the learning never stops. Next Next post: PRISM is real, probably. NSA taps big networks.